Looking for a compact evergreen hedge that’s attractive both when grown in its natural form and when sheared? Japanese boxwood is a perfect fit. In its natural form, Japanese boxwood grows quickly to its mature height and width, and has a dense rounded shape. Plants feature glossy round leaves in bright green. If planted in full sun, leaf tips can turn a bronze-green color. In spring, the green foliage color will return. In spring, small white, inconspicuous blooms appear that offer a light fragrance. If you want to box your boxwoods or shear them into fanciful shapes, you should do most of the heavy pruning just after the last frost in spring. Prune in late-winter in areas with mild winter climates. The goal is to remove all deadwood and do all heavy pruning before the first flush of new growth. Plants perform best when planted in slightly acidic, well-amended soils in either sun or part shade. 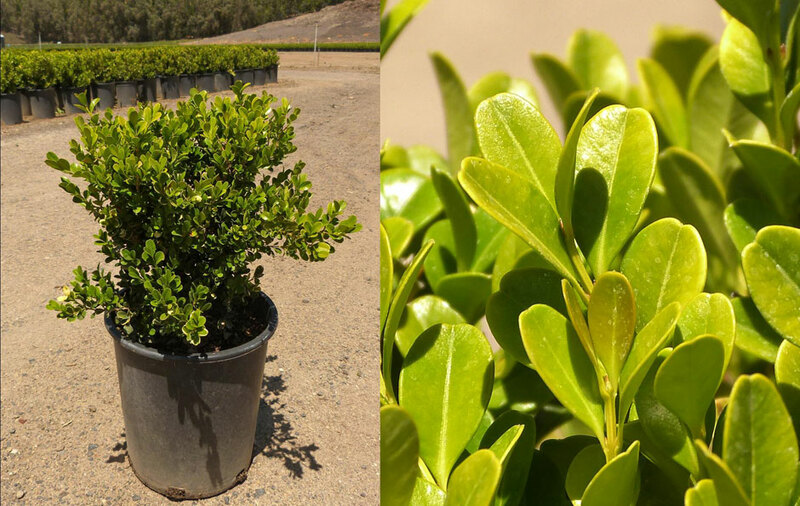 Boxwood, while more drought tolerant after a number of years in the ground, performs best with consistent moisture. Watch out for pests such as spider mites and scale during times of water and heat stress. Take note that this species tolerates nematodes better than other species of boxwood.